Musical history is littered with also-ran operas, works that became overshadowed by more successful or famous settings of the same stories or librettos, from Paisiello’s Barber of Seville and Leoncavallo’s La bohème to Busoni’s Turandot and Ghedini’s Billy Budd. But few instances are more intriguing than that of the German composer Manfred Gurlitt (1890-1972), who was trumped twice over, being beaten by Berg to his Wozzeck premiere by four months and living long enough to see his setting of Lenz’s Soldaten eclipsed by Bernd Alois Zimmermann’s magnum opus on the same subject 30 years after his own. Gurlitt has his own intriguing life story, one that is still mired in confusion to this day. His emphasis on socially provocative subject matter put him at odds with the Nazis when they came to power in the 1930s, yet he seems to have found accommodation with the regime until the revelation of a Jewish grandmother forced him into exile in 1937. Unfortunately, he chose a soon-to-be German ally, Japan, in which to settle and it was only after the war that he regained his artistic freedom, playing a leading role as a conductor introducing Far Eastern audiences to many of the classics of western opera for the first time. To backtrack to the early 1920s, Gurlitt apparently had no knowledge that Alban Berg was also working on a setting of Georg Buchner’s early 19th-century dramatic fragment, Woyzeck (as it was originally published – a misreading incorporated in the early 20th-century reprint used by both composers resulted in the spelling we know today). If Berg’s inspiration was his experience of soldiering in the First World War, Gurlitt had a more political agenda in mind and his setting of largely the same text (18 scenes of Buchner’s original, as opposed to Berg’s selection of 16) takes a more hardened social edge, matched to some extent in the music. Gurlitt is very much of the Neue Sachligkeit (New Objectivity) school of musical thought, alongside figures such as Hindemith, Krenek and Weill, and there’s a lack of sentimentality in his writing that makes Berg’s brand of atonal modernism seem almost Romantic by comparison. Intriguingly, Gurlitt also came up with the idea of using closed musical forms to characterise the different scenes, but his is a more brittle, contrapuntal style that soars to lyrical heights only intermittently and most affectingly in the final orchestral elegy that closes the one-act, 75-minute opera. Gurlitt’s Wozzeck opened in 1926 in Bremen, where he was music director at the time, just a few months after Berg’s had been premiered in Berlin. Comparisons were inevitable and Berg’s won its place in the international repertoire while Gurlitt’s unjustly sank without trace until revived in Bremen in the 1980s, amid the reawakening of interest in the lost Austro-German music of the interwar years. It now crops up occasionally in the schedules of more enterprising German opera companies, lastly in a double bill I sadly missed of both Wozzeck operas in Darmstadt and now in Bremerhaven, where its run neatly coincides with a production of Berg’s opera in nearby Bremen (see my review at Bachtrack.com). 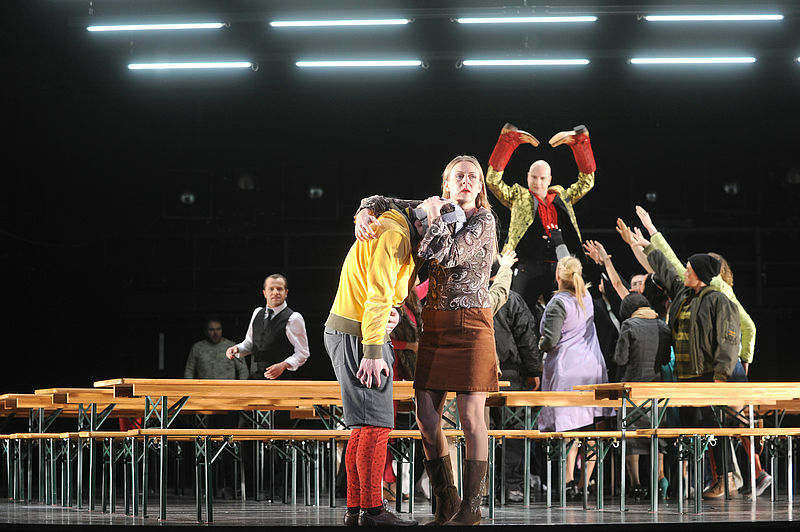 Proof that rare repertoire can be made to live again without spending big bucks is clear from Bremerhaven’s new production, one that goes by the principle of less is more, or even of every expense spared. The stage is stripped back to its backstage walls; with no scenery, the only addition is a bank of trestle tables and benches on a revolve stage and an array of overhead fluorescent lights. Compared to the over-loaded visual impact of Bremen’s Berg I had seen the previous night, this proved to be a model of clear-sighted narrative and emphasis on the characters as real people. 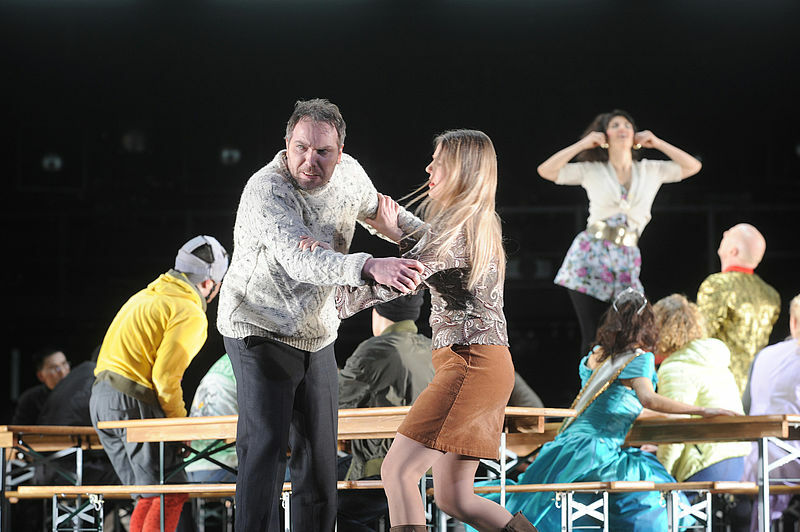 The ever-present chorus emphasised the everyman nature of Wozzeck and his fate – he is just one of many misfits in society, but his bullying by the Captain and Doctor (the latter loses his big scene with Wozzeck in Gurlitt’s version) turns him into a volatile outcast, from a society where anyone with a bit of glamour about them – the Drum-major – can turn the head of a neglected wife, Marie. 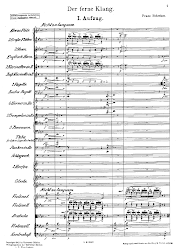 Musically, the orchestra on this first night of the run initially gave the impression that it was still finding its way through the music, but then again a lot of the writing is exposed and often chamber-like in its textures, and once the musicians found their collective feet conductor Marc Niemann was able to exploit the music’s colour, dynamism and swift dramatic pacing to the full. 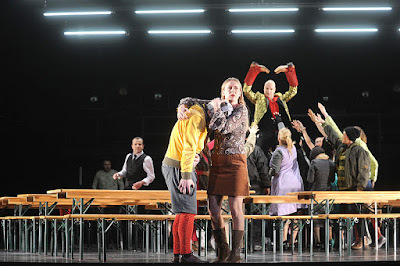 An excellent cast was led by a compelling Wozzeck in Filippo Bettoschi (as with Berg, the role is cast as a baritone), who acted as much with his voice as with his body to portray the sense of degradation and murderous intent that overwhelms the character. In repertoire at Stadttheater Bremerhaven until 27 April.